Aloha - love, o - of, ka I - the I. Ka I is the Hawaiian name of the Divine Source that inspired the great Ho'oponopono teacher and healer Morrnah Simeona and which is present everywhere and in all of us. Everything Aloha o ka I organizes, has its roots in the ancient spiritual traditions of the Hawaiian Islands. The native Hawaiians possessed the knowlegde and techniques to generate energy, ho'omana, for healing and to create a positive attitude. A life steeped in deep respect for and in cooperation with the land. Mahalo, thank you for visiting this website. My name is Ke'Ola Gerda van der Linden. I am the founder of Aloha o ka I. It's my pleasure to share with you the beautiful culture of the Hawaiian islands. This website is respectfully dedicated to the Hawaiian people for keeping the ancient wisdom alive. Which is remarkable, concidering there was no written language until 1820. It's amazing that so much wisdom has survived for those lucky ones among us who may now reap what the ancient Hawaiians sowed. 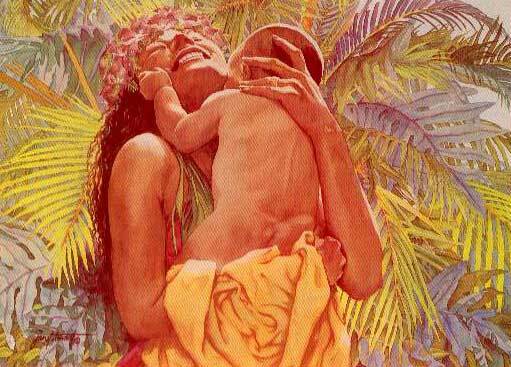 "Ha'ina ia mai ana ka puana", let the story be told. To learn about Morrnah Simeona's Ho'oponopono, Hawaiian Lomilomi massage, Hawaii Tours, receive the Aloha Newsletter or if you want to contact me, please use the contact link at the top of this page.